LAS VEGAS and RIYADH, Saudi Arabia, April 2, 2019 /PRNewswire/ -- Al-Rashed Empire Cinema Consortium has just signed a new deal with CJ 4DPLEX, the world's leading cinema technology company, to open 10 4DX theatres around Saudi Arabia by 2023. "Today is a historic day for both CJ 4DPLEX and Empire Cinemas," said JongRyul Kim, CEO of CJ 4DPLEX. "This is the largest 4DX deal yet for Saudi Arabia and will ensure that the format plays a big role as Saudi Arabia opens itself to international cinema. We are incredibly excited to be a part of this huge moment for cinema in the Middle East." 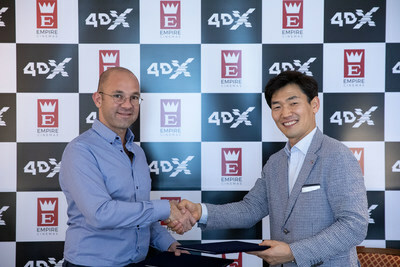 "We are incredibly excited to be signing this new deal with CJ 4DPLEX to bring the immersive cinema technology of 4DX to audiences all over Saudi Arabia," said Gino Haddad CEO of Empire Cinemas. "The deal is just the beginning of a great relationship that we hope will revolutionize the theater-going experience in the Middle East."